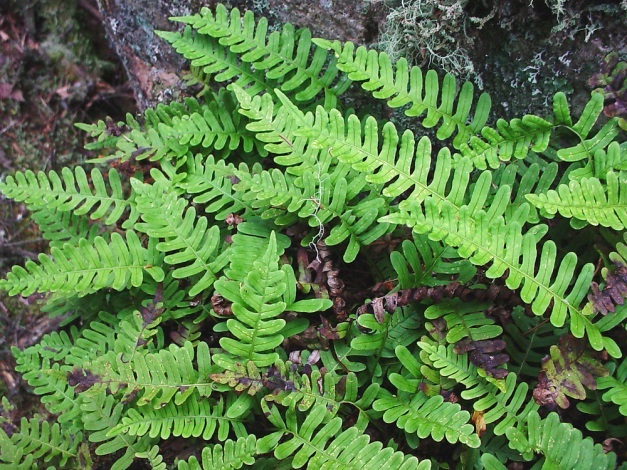 Polypodium virginianum.Glen Mittelhauser. New England Wild Flower Society.gobotany. newenglandwild.org (Accessed 3/2014). Polypodium virginianum is a fern from a branching, scaly rhizome, forming colonies. Leaves evergreen, arising singly from along rhizome, to 40 cm tall, leaf stalk to 15 cm, base scaly, blade to 6 cm wide, pinnately divided to midrib, oblong, tip narrowed and pointed, base blunt, midrib slightly scaly, lobes, 12-20 per side, to 0.7 cm wide, leathery, dark green above, yellowish-hairy below, margin very slightly toothed, tip blunt, base fused to main midrib. 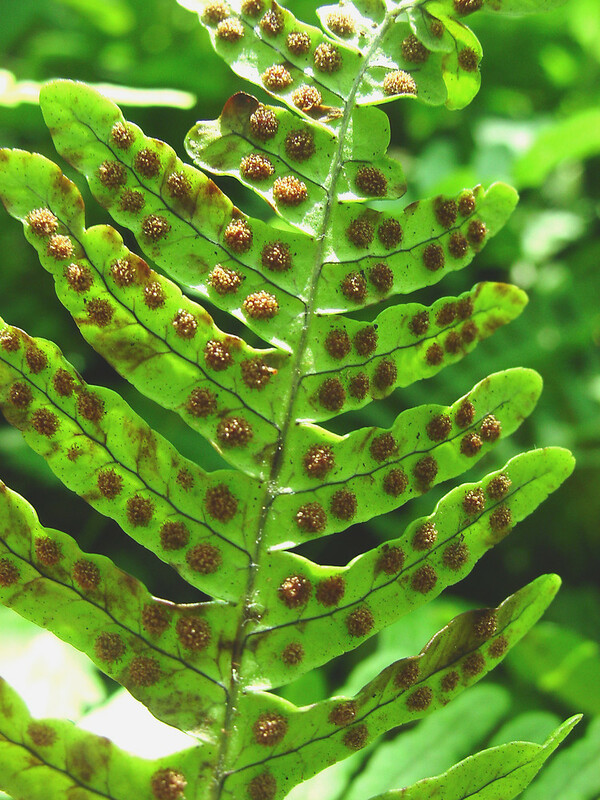 Polypodium virginianum spore cases. By Glen Mittelhauser. Copyright © 2017 Glen Mittelhauser.New England Wild Flower Society. gobotany.newenglandwild.org (Accessed 4/2017). Spore cases round, brown, at ends of veins, aligned between midrib and margin (flowers and fruit: none). Habitat: Typically in woods, on humus covering tops of glacial erratics, sometimes on banks in circumneutral soil.